We head to the highly recommended Priory Hotel for what promises to be a holiday to remember. We have included a free day at leisure and two excursions exploring the areas stunning scenery and best loved visitor attractions. Set in an ideal location to enjoy the beautiful North and West Highlands of Scotland, the Priory has been operated by the same owners since 1972 and has an enviable reputation for quality. The hotel offers free Wi-Fi, a traditional restaurant and welcoming bar. All of the en-suite rooms are equipped with modern amenities including satellite TV, radio, telephone and tea / coffee making facilities. The Hotel has a lift. On the Roof of Wester Ross - This is not a day to forget your camera, the scenery is awe inspiring. We head North, over 'The Fain', offering spectacular views of the Fisherfield Forest Mountains. 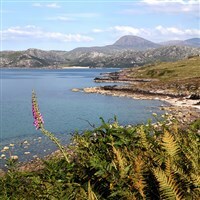 We'll pass the pretty Gruinard Bay and the Isle of Ewe en-route to Gairloch, the perfect stop for a picnic lunch! You might even do a little Whale watching here before we head past the shore of Loch Maree and back to our hotel. Kyle of Lochalsh - Sit back, relax and admire some of Scotland's most dramatic and stunning scenery as we head to Dingwall and climb over the Highlands by train. It's little wonder Michael Palin described this journey as "one of the most beautiful rail journeys in the world"! Enjoy an included packed lunch as you enjoy this magnificent journey to the Kyle of Lochalsh before returning to the hotel by coach.